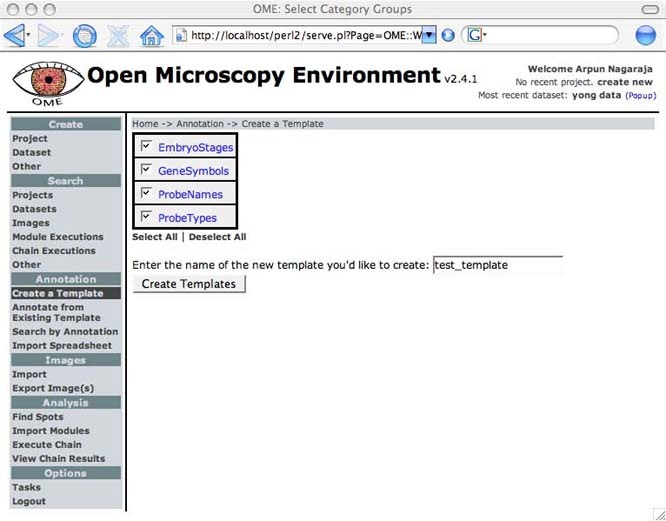 At the moment, the template creation interface is fairly elementary and provides limited, specific functionality. You simply have to select which CategoryGroups you would like to use in your templates, specify a name, and click 'Create Templates'. Clicking 'Create Templates' will create three separate kinds of templates, all with the name that you specified. Their names and descriptions are stored in the database as the Semantic Types AnnotationTemplate, DisplayTemplate, and BrowseTemplate. The templates are stored on disk, usually in /OME/html/Templates. You can find the location of your templates using the search interface. Click "Other" under the Search functions in the navigation menu on the left, select the type of template you want to find from the drop-down menu (AnnotationTemplate, BrowseTemplate or DisplayTemplate), either browse for your template in the displayed list, or enter all or part of the template's name and click the "Search" button.